The world of personal digital assistants is about to get a little more crowded with the pending launch of Apple’s long-anticipated HomePod. The tech giant’s newest gadget for tech-crazed millennials is now ready to go head-to-head with Google Home and Amazon Echo in a race to earn consumer loyalty and capture a bigger share of the ever-changing home electronics wallet. But right from the start, the pricey Apple HomePod is up against two products that have already been on the market long enough to have ironed out many of the inevitable kinks and adapted their offering to meet consumer demands. 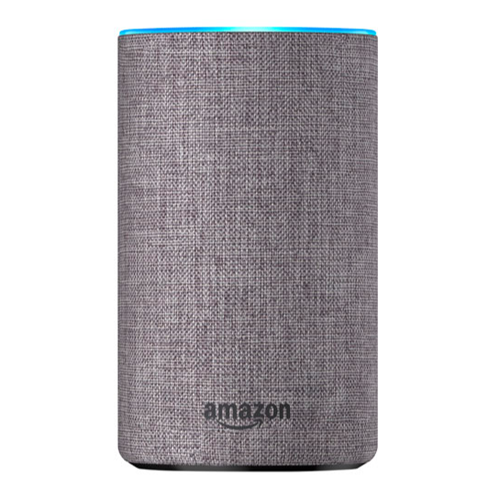 Amazon launched Echo back in late 2014 while Google brought their Home to market in late 2016 with both products gaining valuable traction by adding popular apps, accessories and completing the requisite tweaks. So how does being last-out-of-the-gate impact the future of HomePod? Well, before you pack the sleeping bag and take your place in line at your local Apple store, let’s look at the pro’s and con’s of all three smart speaker systems. It will come as no surprise to fans of Apple products that the HomePod delivers big on sound quality and handily beats out rivals Home and Echo. The unit uses what Apple has classed as “spatial awareness” with seven beam-forming tweeters and a 4-inch, Apple-designed woofer to create a virtual surround-sound system regardless of where in the room you are. By comparison, while both Echo and Home can be tethered to better sound systems, their stand-alone capabilities just don’t compare to the Apple. The caveat with HomePod is that it only supports on-device streaming from Apple Music while both Echo and Home support a number of music services including Spotify, Pandora, Radioplayer and of course Google Play Music and Amazon Prime Music. For voice activated commands, HomePod’s late entry into the race has clearly left them at a disadvantage as their competitive set has continually fine-tuned their offerings. For example, both Home and Echo allow users to initiate and accept calls by voice whereas HomePod users must first accept calls on their iPhone, then select the unit as a speakerphone. And Siri is only capable of recognizing one account at a time – meaning messages, notes and reminders can only be sync’d to the account of the individual who set it up. 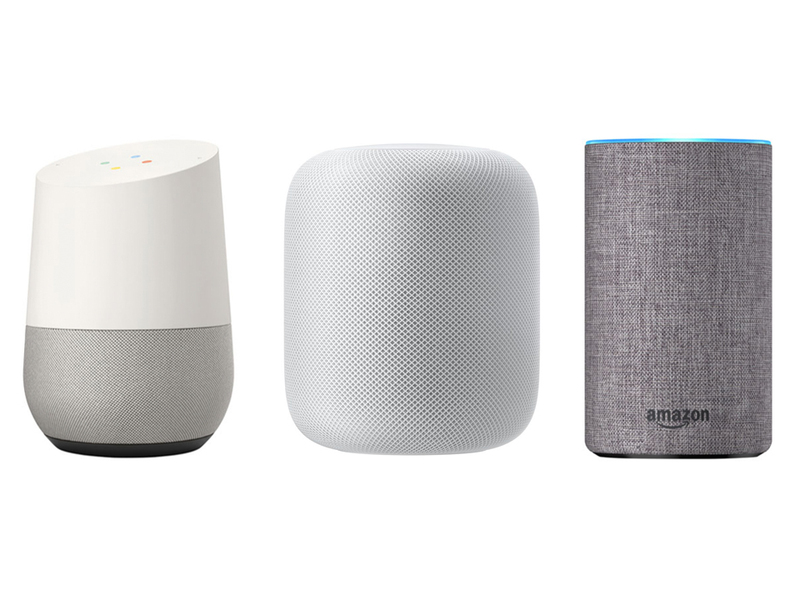 Of course, while both Home and Echo units work with Android as well as iOS smart phones, HomePod is limited to just the Apple line of smart products. Amazon Echo in one of its many sizes and colours. Now you would think that with the growing trend toward home-automation, the newly launched HomePod would be all over it, but not so. In fact, Apple has fallen somewhat short by delivering fewer options and banking on their “scene” multi-activation feature to set them apart from the competition. By using a simple verbal command such as “Hey Siri, good morning” users can activate their coffee maker, lights and thermostat, etc. The challenge for Apple is that the Home app set-up can be problematic for the technically challenged and will likely need a serious re-think if it’s ever to provide the user-friendly experience they’re seeking. In the meantime, Google Home has upped its repertoire and now offers users the ability to not only activate lights, switches and thermostats but also robot vacuums, locks, sprinkler systems, air conditioners and more. The Amazon Echo has also stepped up their game with the intro of cameras, locks and home security systems to it’s dossier of compatible home automation features. This is what happens when you’re a couple years ahead of the new kid. And consumers seem dead-locked when it comes to deciding on which voice recognition system it more effective at accurately capturing and responding to user commands. It’s down to Echo’s “Alexa” or Home’s “Assistant” and yes, you would be right to assume Siri is out of the running. It seems Apple’s helpful voice isn’t so helpful and requires more precise wording, pronunciation and frequent repetition in order to perform simple tasks. A rather crucial smart speaker element that will need to be reviewed and revamped if it’s going to support the success of the HomePod. And although the sales of tens of millions of iPhones have propelled Siri into top spot as the most widely used digital assistant, for those looking for quick intel (without repetition), HomePod fall short in delivering fast, accurate data. In fact, it doesn’t begin to come close to Home’s Google Assistant that takes full advantage of the brand’s robust search engine to quickly analyze and deliver factual answers to almost any question. Speaking of facts, when it comes to tapping into 3rd party apps, a recent study by USA Today found that of the top 50 most downloaded Apple Store apps, only a few – such as Twitter, Yelp, Uber and Whatsapp Messenger – were functional with Siri while the big players such as Facebook, Instagram, Netflix, Good Maps and Spotify were MIA. Further, both Google Home and Amazon Echo have partnered with multiple organizations that recognize voice commands and make ordering a pizza or taxi as simple as turning on your lights. Again, the benefits of getting into the game early and reacting to consumer feedback is showing here! 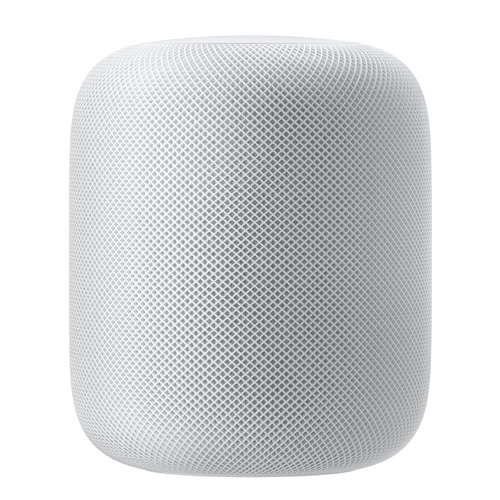 Now where HomePod does excel (in addition to delivering exceptional sound) is in security and safeguarding your voice data. At present, all three brands process your voice-based requests on their servers because the individual speakers simple don’t have the computing power to do it. Both Amazon and Google store this data (which is linked directly to your account) whereas HomePod is able to process your data through an unlabeled identifier which keeps it anonymous and untraceable. This is one example where being last out of the gate has benefited Apple. The ability to anticipate security related concerns and develop a solution before your product hits the market. 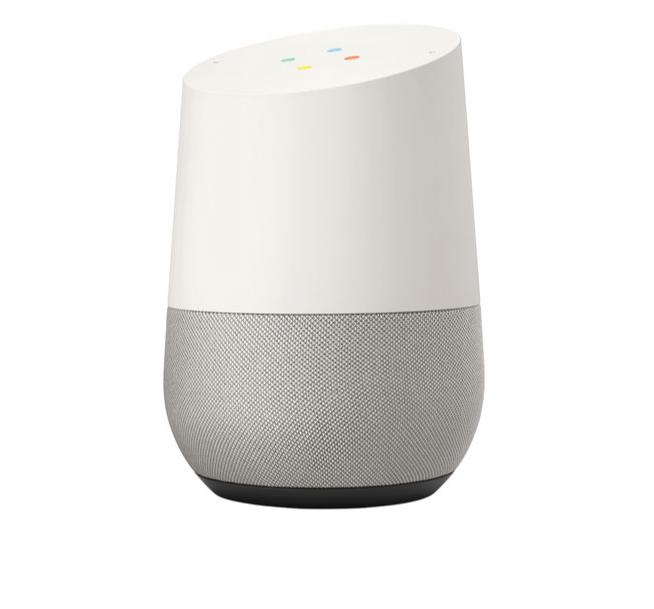 Any word on when the Google Home Max will be available in Canada? That is the real winner.